Years ago I saw a TV show where Heston Blumenthal tried to add a little bit of wonder back into the cinema experience. One of items he made that almost every one raved about was his popcorn ice cream. There was a slight problem – I don’t like popcorn. Not one bit. It’s overpriced corn that gets stuck in your teeth. Awful stuff indeed. This rejection of something that so many people clearly love has left me a bit stranded at movie theatres with all my friends munching happily away. It’s the equivalent of someone coming for a braai (BBQ for non South Africans), and bringing tofu to eat, it’s a little awkward. So perhaps if there was nothing to stick in the teeth it would be better. It’s worth a try, I thought to myself. The result – surprisingly good! In fact, my hottie ladylove-wife (who supports my odd obsession with food but seldom likes it as much as I do) was bowled over and stated it’s the best thing I’ve ever made in my life! This was a large potful of popcorn. Mix and warm up the milk, cream and sugar and stir until the sugar is dissolved. 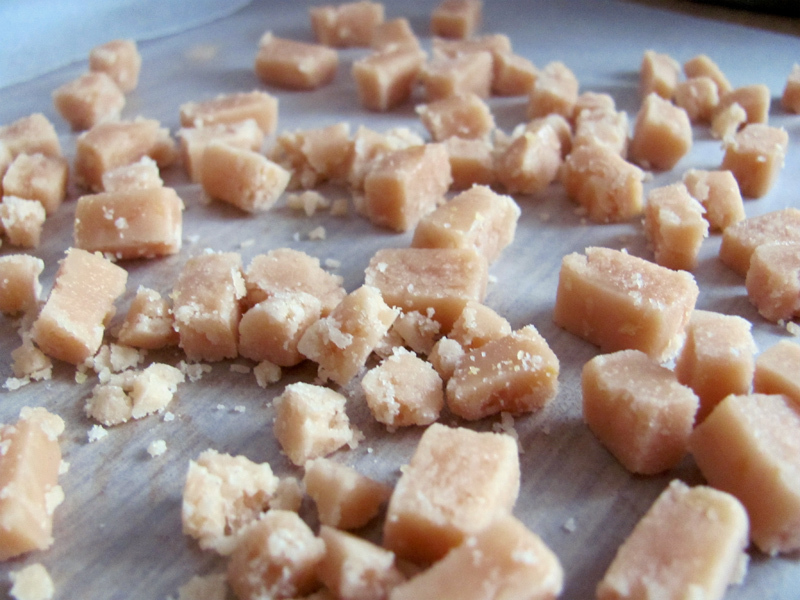 The heat is just to help the sugar dissolve. Next, pop your corn (side note: I used coconut oil because it has no taste that can transfer to the popcorn). 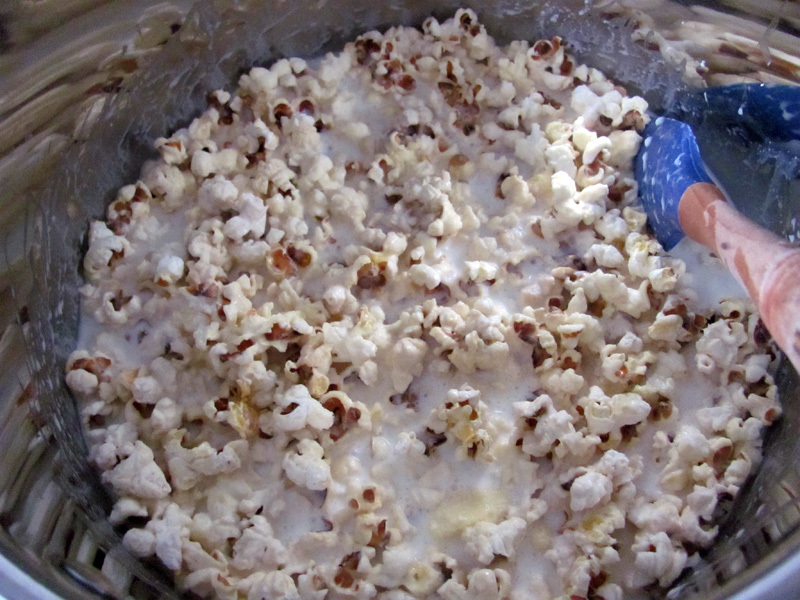 Add as much of the disgusting popcorn to the warmed milk/cream/sugar as you can, the more contact the milk has with the popcorn the better. Strain as much of the liquid you can. Add the egg yolks and whisk. Put this mix into a saucepan and warm up slowly while mixing until your custard is thick enough to do the spoon test (dip a wooden spoon into the custard and if you can run your finger along the back with it not running it’s ready). If you over heat it, the eggs with cook and you’ll have scrambled eggs. Don’t do that. 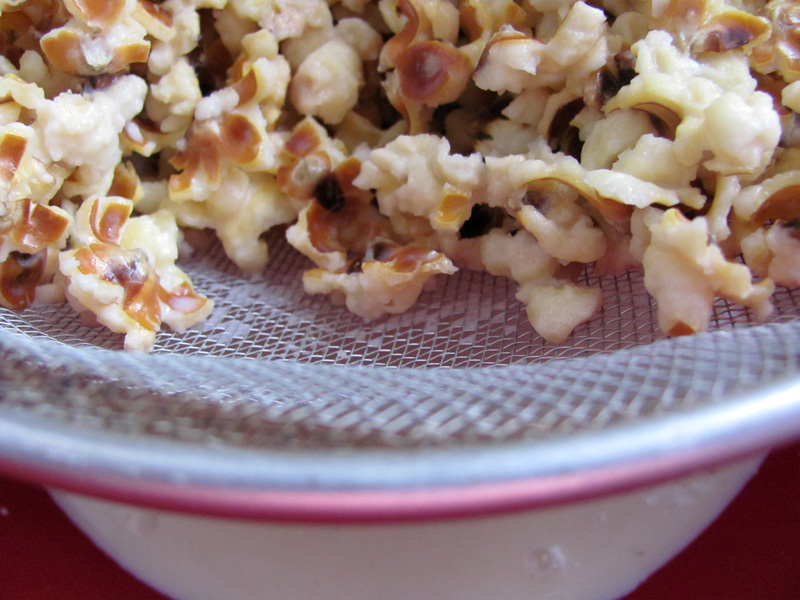 Get as much of the liquid out of the popcorn – this stuff is worth more than the souls of the innocent! Let this mixture cool and age for at least eight hours in the fridge. Once aged and cool, churn for a few minutes. I got this recipe here, and I think it’s so well explained (with gifs!) that you should go check it out there yourself. Mine came out a little fudgy but incredibly more-ish. Lemon salt is really good with this. 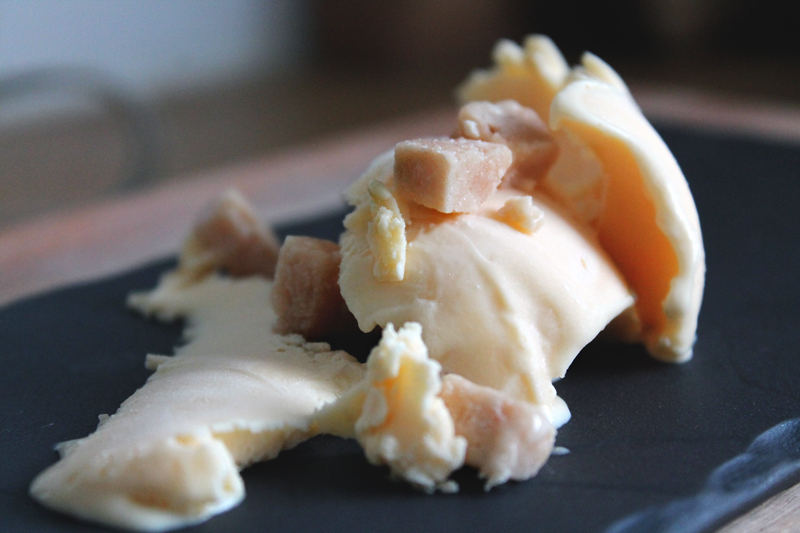 Popcorn ice cream with salted caramel chunks. This looks incredible! I will be trying this soon 🙂 Thanks for sharing this gorgeous recipe! It really is quite yum!